Arctic Mountain Front Suspension with FOX FLOAT 3 Shocks: The Arctic Mountain front suspension packs the essentials. The ProClimb-7 mountain ski is 7" at the tip, tapering to 6.5" at the center to enhance your carving. Single-post, angled-out spindles help you shed some sled weight while maximizing quality and strength. FOX FLOAT® 3 air shocks use “negative” spring technology to deliver a plush ride during initial travel and faster, stiffer cornering while maintaining big-hit control. FLOAT-ACTION Rear Suspension with Front Arctic Cat IFP and Rear FOX FLOAT 3: The FLOAT-ACTION rear suspension’s unique tri-hub rear axle system is engineered to be very light and very strong. 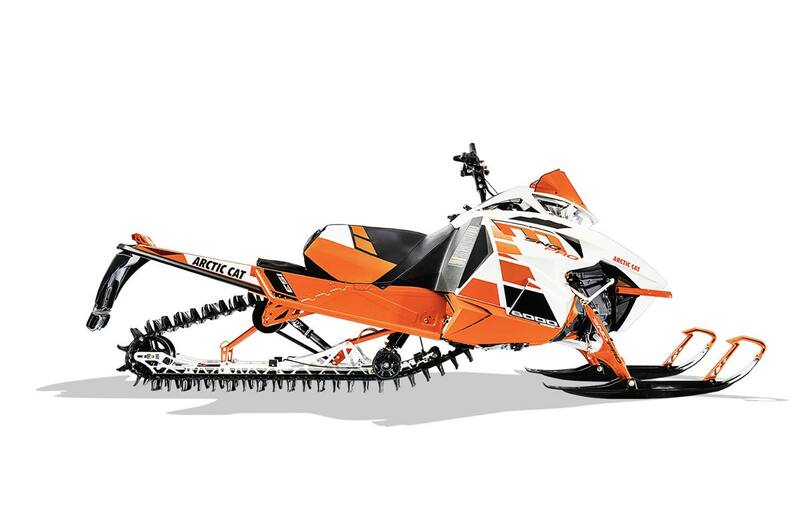 Front Arctic Cat IFP shocks provide stability, while rear springless FOX FLOAT 3 air shocks reduce snow buildup weight and provide a full range of pressure/tuning options.